If the name does not trigger immediate recognition you are not alone. All the better that digital computing's voices are writing about how Doug Engelbart changed computer history with a computing demo on Dec. 9, 1968 at San Francisco's Civic Auditorium. Klint Finley in Wired said, "You can draw a line from the technologies introduced at the 'Mother of All Demos,' as WIRED writer Steven Levy dubbed the event in his book Insanely Great, to the internet, the web, Wikipedia, the Macintosh, Microsoft Windows, Google Docs, and a host of other technologies that dominated daily life by the time Engelbart died in 2013." Finley and other tech watchers are talking about how, 50 years ago, Engelbart, an engineer at Stanford Research Institute (SRI), delivered the pivotal moment in computing. The Mercury News said the appearance was 90 minutes long and the audience numbered about 1,000. "He showed off a mouse made of wood that could manipulate electronic text, and a computer that displayed different programs in windows on a screen. He collaborated with colleagues miles away using video," wrote Levi Sumagaysay. Looking back, it is possible to see beyond just awe of witnessing a computing machine coming alive for a mouse-equipped user. He was showing off experimental computer technologies now commonplace. Video notes said, "The live demonstration featured the introduction of the computer mouse, video conferencing, teleconferencing, hypertext, word processing, hypermedia, object addressing and dynamic file linking, bootstrapping, and a collaborative real-time editor." 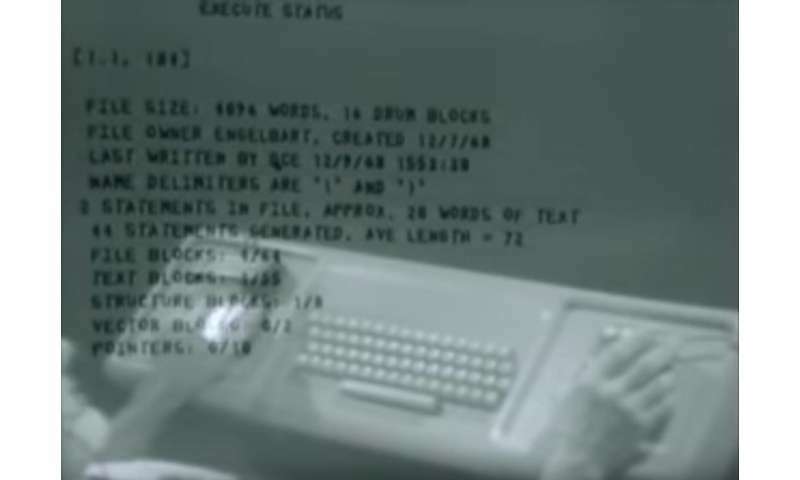 Ryan Whitwam in ExtremeTech said Engelbart and the team at SRI were already hard at work on a computer system for creating, managing and linking files. The demo, added ExtremeTech, included a preview of ARPANET. This system would become the internet as we know it, said Whitwam. "The NLS (oN-Line System) seen in the demo was one of the first four nodes of ARPANET." Whitwam brought home to readers, though, that the technology he showed was in use at SRI, relying "on a central database connected to multiple terminals. At the time of the demo, SRI had six working terminals with plans to add six more to help researchers get their work done quicker and more efficiently." Plus ca change? Interestingly, his demo was sent to the UK back then and one comment giver on the video page said that, as a university AV technician, he ran the film for staff of the University of London Computer Center and other interested parties. He said, after 90 minutes, when it ended, "the audience of senior London computing academics filed out, I heard several make comments such as "Interesting, but it will never catch on" and "What a waste of time." OSNews reflected: "Letting non-engineers interact directly with a computer was seen as harebrained." Cyrus Farivar, Ars Technica, said that before his famous demonstration, Engelbart had explored what he saw as the future, in a 1962 paper, "Augmenting Human Intellect: A Conceptual Framework." The machine was the tool but the exercise was knowledge work and the impact would make its mark on an information-based workforce. Engelbart wrote, "In such a future working relationship between human problem-solver and computer 'clerk,' the capability of the computer for executing mathematical processes would be used whenever it was needed. However, the computer has many other capabilities for manipulating and displaying information that can be of significant benefit to the human in nonmathematical processes of planning, organizing, studying, etc." Farivar reported that the Museum, in Mountain View, was hosting a few events related to the anniversary. OSNews told its readers that "he pulled a team together and built a working prototype: the oN‑Line System. Unlike earlier efforts, the NLS wasn't a military supercalculator. It was a general‑purpose tool designed to help knowledge workers perform better and faster, and that was a controversial idea." The father of my mouse callus and Internet addiction. And spreadsheets. It beats a sliderule.